South Africa’s criminal underworld: Is the media reporting the real story? The bomb blast that killed two people in Bedfordview, Johannesburg, this week has catapulted the country’s criminal underworld back into the news. But disturbing reports of the intimidation of two journalists - and police complicity in this - have raised questions about how we are reporting on the criminal underworld and its activities. By KHADIJA PATEL. On Thursday, the South African National Editors Forum (SANEF) said Beeld newspaper would be pressing charges against management of the Harbour Fish & Meat Market, a restaurant in Bedfordview, after a team of photographers was allegedly harassed for taking pictures. The restaurant is the well-known unofficial office of Czech fugitive, Radovan Krejcir, who often meets friends and associates here in a specially constructed bullet-proof booth. According to SANEF, restaurant employees seized the photographer’s camera after he was spotted taking pictures of the restaurant from the parking lot of the Bedford Centre. “They removed camera equipment from the journalists’ vehicle and grabbed the camera from photographer Cornel van Heerden’s hands,” a SANEF statement said on Thursday. The journalists are said to have called Bedford Centre security, who, they allege, refused to intervene. Beeld then called the Bedfordview police station and three officers were dispatched the scene. The restaurant then offered to release the equipment on condition that pictures of their restaurant were deleted in front of them. “Shockingly, the SA Police Service members present agreed that the pictures should be deleted,” Beeld editor Adriaan Basson said in the statement. Basson advised his photographer to do as they were told as he says he felt his staff members were under grave threat. “We have seen numerous photos and footage of the restaurant before. This was a complete overreaction by the restaurant and a failure by the Bedford Centre’s management to intervene,” he says. And while Basson says he will be raising the failure of the South African Police Services (SAPS) to intervene effectively with Commissioner Riah Phiyega, the incident is telling of a broader culture around Krejcir in Bedfordview in which the police seem ultimately irrelevant. 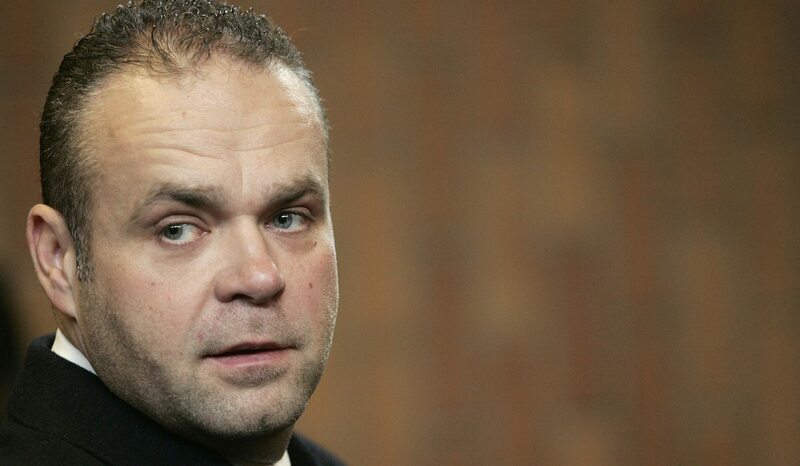 Troubling reports from unnamed crime intelligence officials are that this week’s bomb blast at Krejcir’s Money Point gold and diamond exchange business may be the opening salvo in an escalated warfare between the Czech fugitive and his associates. William Bird, director of Media Monitoring Africa, says it is concerning that it is only now, after a bomb blast killed two people, that we are really seeing significant efforts to discover who Krejcir actually is. “I think far too many stories have focused on the incident and there have been only a handful of stories that have sought to unpack who he is and what is really going on,” Bird says. “So even where we saw the incident with the James Bond-style attempt, some key questions about why someone would want to take him out weren’t clear. “It was as though the world in which he existed was simply too murky,” Bird says. Bird adds that some security experts believe South Africa has become a haven for organised criminals. Others contend that the way in which the underworld is reported on in the South African media lends it glamour and gives it the sheen of respectability. And when it comes to Krejcir, there is particularly a heightened sensitivity about how he is characterised in the media. Journalists who dip their feet in the criminal underworld inhabited by Krejcir argue that the public fixation with him is a function of crime being a major part of South African life, be it violent robberies or drive-by shootings. “I think anyone living in South Africa, and particularly in Johannesburg, has, at some stage, felt like they were walking above a murky underworld. Sometimes the glass beneath our feet cracks (Radovan Krejcir survives an assassination attempt by a car rigged with a home-made shotgun which is remotely controlled. Brett Kebble is gunned down on a quiet street in the middle of the night) and the headlines scream at us,” EWN journalist Alex Eliseev told City Press last month. He believes that even in countries where crime is far less of an issue, there’s still a curiosity about the lives of cops, gangsters, drug dealers and serial murderers. Bird, however, feels that there has not been sufficient interrogation, context and reporting around the bomb blast in Bedfordview this week. He describes the media reaction to the blast as “underwhelming”.